American evangelist and educator, Robert Reynolds Jones was born in Dale County, Alabama on October 30, 1883. He was converted to Christ at age 11 and began to preach revival meetings at 13; he was licensed to preach the Gospel at age 15. 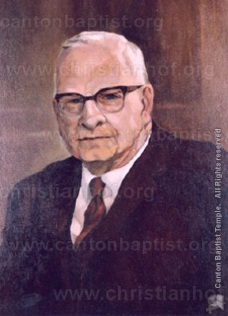 Bob Jones preached in cotton fields, country churches and under brush arbors. Later he conducted city-wide campaigns in American cities of all sizes and on many foreign mission fields. In 1927, the Methodist evangelist founded Bob Jones College (now BJU) where each year thousands of students from all states in the USA and many other countries are educated. The school in Greenville, South Carolina is the outgrowth of Dr. Bob Jones’ ministry among young people whose faith had been shaken in other schools of higher learning. His vision was to build a school that would combat the atheistic trend in education and become a center of Christian learning. Throughout his entire ministry, “Dr. Bob” was a leading spokesman for the fundamental, conservative, and scriptural position against modernism, neo-orthodoxy, and neo-evangelicalism. The thousands of graduates of Bob Jones University serving the Lord in churches at home and abroad are an extension of his ministry to this hour.